You can order the book Dulcimer Xing from the Bookstore. 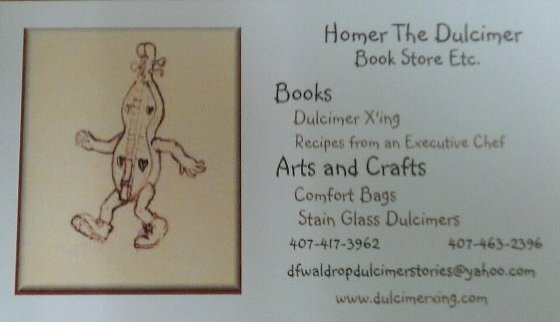 Click on the Bookstore tab and enter the fascinating children's world of Homer the Dulcimer. The author Dennis Waldrop has also written a cookbook - Recipes from an Executive Chef. These are all of the hand written recipes of his grandfather Executive Chef George W. Weber. They have all been compiled into this wonderful nastalgic book of a simpler time and era when fine cooking was an art. You can also see the arts and crafts that are avilable through Homer the Dulcimer. There are wonderful 'Comfort Bags' to protect your dulcimer as well as stained glass dulcimers. See them on the Arts and Crafts tab. If your organization is interested in having a Fundraiser and selling Dulcimer Xings' and Recipes from an Executive Chef contact us through our Email address for information on how to do one of our fundraisers.